For the sauce, cut the jalapeños into quarters lengthwise and remove the seeds. Cut into smaller pieces and add to a blender. Trim the root from the scallion and remove the outer membrane. 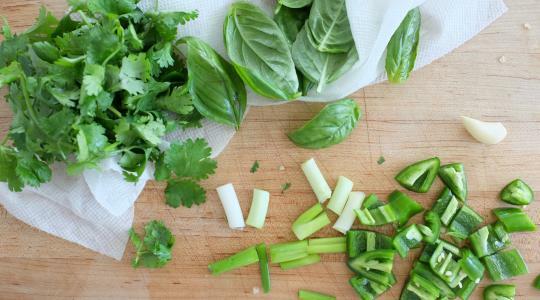 Cut the scallion into 1-inch pieces and add to the blender. Add the garlic, cilantro, basil, mayonnaise, olive oil, lime juice, and salt. Puree until smooth. Pour into a bowl and stir in the sour cream. Refrigerate (it will thicken up a little). 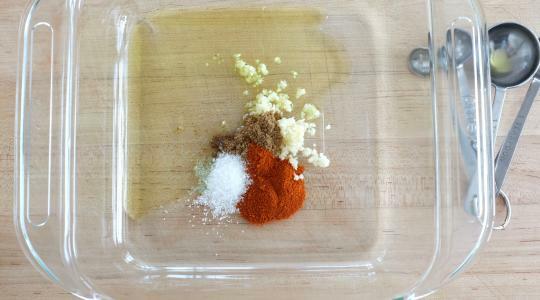 For the fish, in a square glass baking dish, stir together the garlic, paprika, cumin, salt, and oil. Add the fish and turn to coat in the marinade. Let marinate in the refrigerator for 15 minutes. Heat the grill to medium-high. Oil the grates. Cook the fish 3 to 4 minutes per side, until opaque throughout. 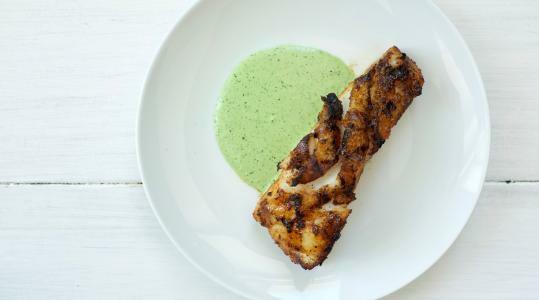 Serve with the green sauce.